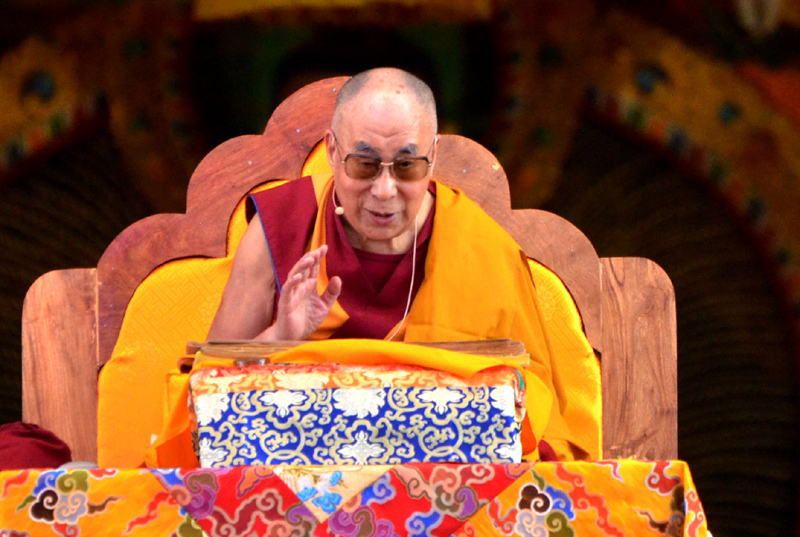 His Holiness the Dalai Lama at the Tashi Lhunpo in Bylakuppe , Karnataka, India on December 22,2015 . Bengaluru — In reply to a question about whether it is possible to preserve religious values without religion, the spiritual leader of Tibet suggested that in a world of 7 billion people, where 1 billion express no interest in religion, there has to be a way of exchanging the understanding of love, compassion, tolerance and forgiveness. His Holiness addressed a meeting of the Indian Administrative Service (IAS) Association (Karnataka) in Bengaluru, Karnataka, India on January 2, 2016.. "Brothers and sisters," he greeted them. "I'm very happy to be able to meet with you today. " "We are all part of humanity, 7 billion of us who are fundamentally the same. Of course, there are differences among us of faith, colour of skin and colour of hair, some of us come from different countries and speak different languages, but these are secondary differences." His Holiness said. "The primary thing is that we are essentially the same. Many of the problems we face, we make for ourselves, based on our mistaken emphasis on these secondary differences between us," he said, adding: "Seeing each other in terms of 'us' and 'them' and being motivated by a strong sense of self-centredness are the source of violence, killing and corruption in our world." "Instead we have to make an effort to promote a sense of the oneness of all human beings. We have to think about the welfare of the whole of humanity. If humanity is happy, as individuals we'll all be happy. If humanity is wracked with fear and suspicion, we'll be unhappy." Comparing ancient Egyptian, Chinese and Indian civilizations, His Holiness suggested that the Indus Valley culture had given rise to by far the greatest number of thinkers and teachers, such as the Buddha. He said that as members of the IAS, his listeners were in a position to help promote and preserve ancient Indian values. He said he didn't mean performing pujas and rituals so much as values like ahimsa and the science of the mind. "Knowledge of the mind, emotions and their workings is something that can be studied on an academic level. It's on that basis that I have engaged in discussions with modern scientists over the last 30 years. The benefits have been mutual. I've learned, for example, that traditional Buddhist cosmology, depicting a flat earth with Mt Meru at its centre, is mistaken. "On the other hand, the quantum physics assertion that nothing has objective existence seems to correspond with the Madhyamaka view that, since all things depend on causes and conditions, they only exist as designations." His Holiness told his audience that having lived the last 56 years, the best part of his life, in this country, thoroughly educated by ancient Indian thought, he feels like a son of India. Wherever he travels in the world he shares the ancient Indian ideas of ahimsa and inter-religious harmony. "Be honest, transparent and truthful; that way you'll establish trust," His Holiness said when asked for his advice to Indian civil servants. To a question about whether it is possible to preserve religious values without religion he said this is what he calls secular ethics. He conceded that some friends are wary of the word secular, but he interprets it to mean respect for all religious traditions and even the views of those who have no faith. He suggested that in a world of 7 billion people, where 1 billion express no interest in religion, there has to be a way of exchanging the understanding of love, compassion, tolerance and forgiveness. That way is to cultivate secular ethics. His Holiness mentioned ongoing projects in North America, Europe and India to formulate a curriculum to incorporate secular ethics into the modern education system. He also noted the effectiveness of nearly a dozen US cities declaring themselves 'cities of kindness'. A final questioner wanted to what had happened when the Buddha achieved enlightenment under the Bodhi Tree. First His Holiness drew attention to the more than 300 volumes of scripture translated from Sanskrit into Tibetan that can be seen as answering this. Then he mentioned Buddha nature that refers to the fundamental mind, a mind that is naturally pure, that is free from anger, attachment and ignorance. Since these defilements or disturbing emotions are not a part of that mind, they can be eliminated. When that occurs, the Buddha's mind is revealed. Can there be forgiveness without repentance? People nowadays talk of forgiveness even to the unrepented ones (let alone penance according to fault): institutional thieves who have never returned the money, warlords who have not compensated the victims of their bombings, agricultural landlords and speculators who have not distributed the lands they or their ancestors robbed to the people. I say less forgiveness and more popular justice! Sharpen the pitchforks, guys, there are too many wrongs to undo: those who don't sincerely and spontaneously repent, and correct their wrongdoings, deserve no forgiveness.